Metal-organic frameworks – MOFs for short – are hot! Consisting of small clusters of metal atoms linked by rigid organic molecules, these exciting new materials can store huge quantities of gaseous fuels such as hydrogen (Ref. 1 below) and methane (Refs 2 & 3 below) and greenhouse gases such as carbon dioxide. Their amazing storage capacity is due to a periodic, open structure that creates internal surface areas as high as 6000 square metres per gram of material. That’s about the size of a football field – or the internal floor area of the Australian Synchrotron. The huge surface areas in MOFs can be used as a new way of storing fuels and greenhouse gases, for industrial catalysis or in medical diagnosis. However, although MOFs are the subject of intense research activity around the world, their synthesis is not well understood. Danielle Kennedy and her CSIRO colleagues are developing high-throughput methods for preparing and screening lanthanide MOFs. They are using x-ray powder diffraction at the Australian Synchrotron to find out whether the materials produced are crystalline and have the large ‘unit cells’ (the main repeating units of a crystal structure) that indicate the ordered porosity common to MOFs. As part of the work, Dr Kennedy and co-workers Matthew Hill and David Hay have designed and built a high‐throughput sample stage that has enabled them to analyse over 600 samples on the powder diffraction beamline in less than 36 hours, something that would normally take almost two months without the use of the super-bright synchrotron light source. The project at the synchrotron has allowed the synthetic ‘hot spots’ for MOFs to be quickly worked out, putting the materials on the fast-track for exciting applications. 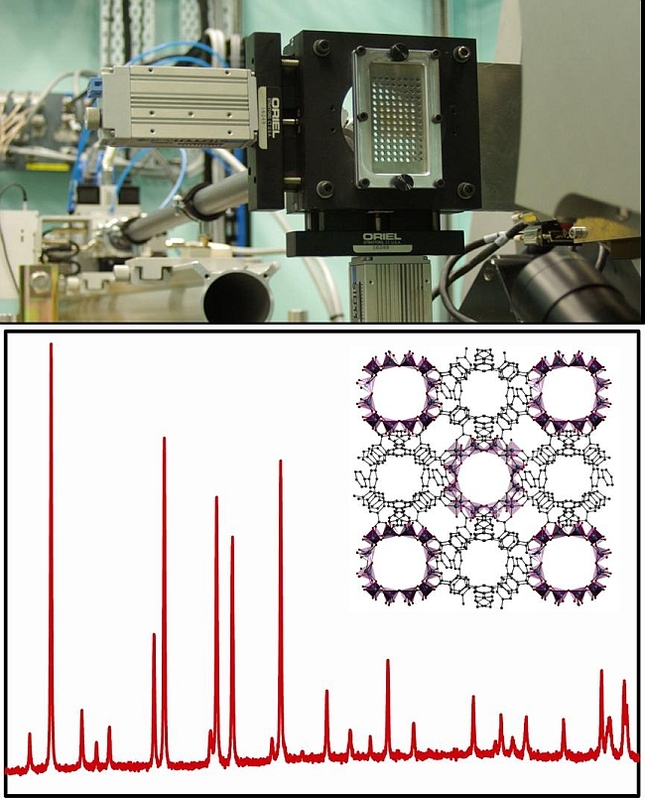 Caption: 600 samples can be examined in 36 hours using the Australian Synchrotron (top), giving x-ray diffraction patterns (bottom) of new MOFs (inset, bottom). Images courtesy of Matthew Hill. Sumida, K.; Hill, M. R.; Horike, S.; Dailly, A.; Long, J. R., Synthesis and Hydrogen Storage Properties of Be12(OH)12(1,3,5-benzenetribenzoate)4, J. Am. Chem. Soc. 2009, ja-2009-072707. Thornton, A. W.; Nairn, K. M.; Hill, J. M.; Hill, A. J.; Hill, M. R., Metal-Organic Frameworks Impregnated with Magnesium-Decorated Fullerenes for Methane and Hydrogen Storage, J. Am. Chem. Soc. 2009, 131(30), 10662. Thornton, A. W.; Hill, M. R.; Nairn, K. M. Gas Adsorption Material. 2009900030, 2009. This article is an updated version of the Australian Synchrotron feature in Australasian Science, September 2009. Click here to see more Australasian Science synchrotron features.